Hypertensive heart disease refers to heart problems that occur because of high blood pressure that is present over a long time. High blood pressure means the pressure inside the blood vessels (called arteries) is too high. As the heart pumps against this pressure, it must work harder. Over time, this causes the heart muscle to thicken. Because there are often no symptoms with high blood pressure, people can have the problem without knowing it. Symptoms most often do not occur until after many years of poor blood pressure control, when damage to the heart has occurred. Without treatment of high blood pressure, symptoms of heart failure may develop. Sometimes, the muscle can be so thick that it does not get enough oxygen. This can cause angina (chest pain). 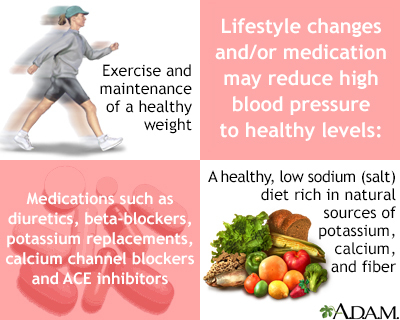 High blood pressure also leads to thickening of the blood vessel walls. When combined with cholesterol deposits in the blood vessels, the risk of heart attack and stroke increases. Hypertensive heart disease is the leading cause of illness and death from high blood pressure. Call your health care provider if you have high blood pressure and develop any symptoms. Guidelines can change as new information becomes available, Therefore, your health care provider may recommend more frequent screenings based on your blood pressure levels and other health conditions. If your blood pressure is high, you need to lower it and keep it under control. Carefully control diabetes and high cholesterol. Michael A. Chen, MD, PhD, Associate Professor of Medicine, Division of Cardiology, Harborview Medical Center, University of Washington Medical School, Seattle, WA. Also reviewed by David Zieve, MD, MHA, Medical Director, Brenda Conaway, Editorial Director, and the A.D.A.M. Editorial team. Editorial update 06-22-18.